The iYAYA inflatable camp pillow is a low-cost, self-inflating, insulated camp pillow with a twist safety valve, contoured impressions, and a water-resistent outer shell. I don’t often recommend pillows in hammocks, at least not using them in the traditional way to support the back of your head. In a hammock, I most often look for support on the sides of my head, much more like a U-shaped travel pillow. However, one thing I like about inflatable camp pillows is the ability to deflate and shape them to your liking. The contoured impression the middle of the pillow forms a nice “pocket” for the back of my head. The iYAYA camp pillow is a great entry-level camp pillow with a low cost but with all the features you might expect from a major brand. The twisting safety valve locks into place to ensure air doesn’t leak out. For me, as few as two breaths was all I needed to inflate the pillow to where I wanted it. Or, you can simply leave the valve open and wait for the pillow to slowly self-inflate. This is about how inflated I kept the pillow when I used it. I didn’t really care for the feel of the outer shell, so when I used the pillow I used a make-shift pillow case using either a shemaugh or a head buff. The iyaya camp pillow covered with a shemaugh pillow case. 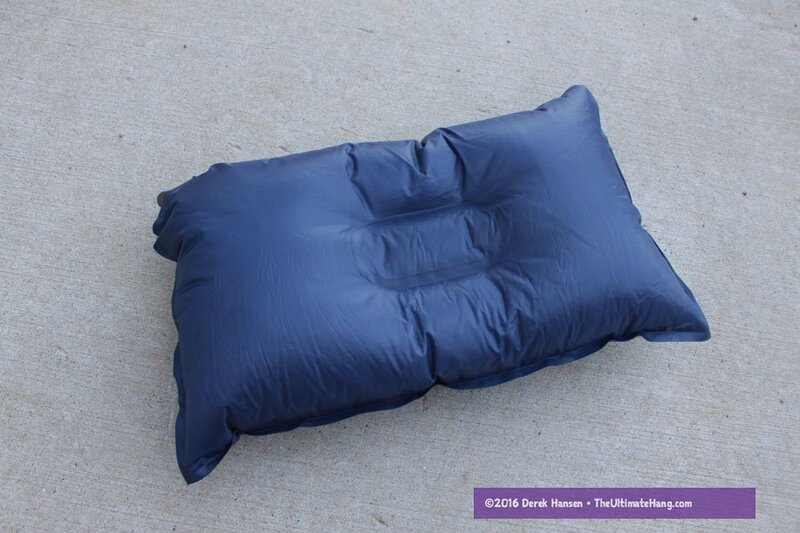 This particular pillow doesn’t deflate very small, due in part to the insulation, so it isn’t something I would typically carry backpacking, but for a car camp, it works just fine. My kids really prefer using pillows like this when we camp. Construction and Craftsmanship ♥ ♥ ♥ ♥ ♥ The outer shell material wasn’t very comfortable for me, but it is typical of other self-inflating pads I’ve used. I agree. Don’t generally care due a pillow inn my hammock. I did try this pillow from Dutch Wear Gear. It works fairly well. Lasted 1 night and popped. Complete junk. I recommend a Coleman or an Alps air mattress. More expensive, but they will actually last. Only good thing was the built in pump which took forever but nice to not have to rely on an electric one.